High blood pressure is also known as hypertension. Pressure created by circulating blood with each & every pumping of our heart is known as blood pressure. Because of heart beats, pressure of the blood is circulated in a declining order through body’s veins, arteries, arterioles, and capillaries. 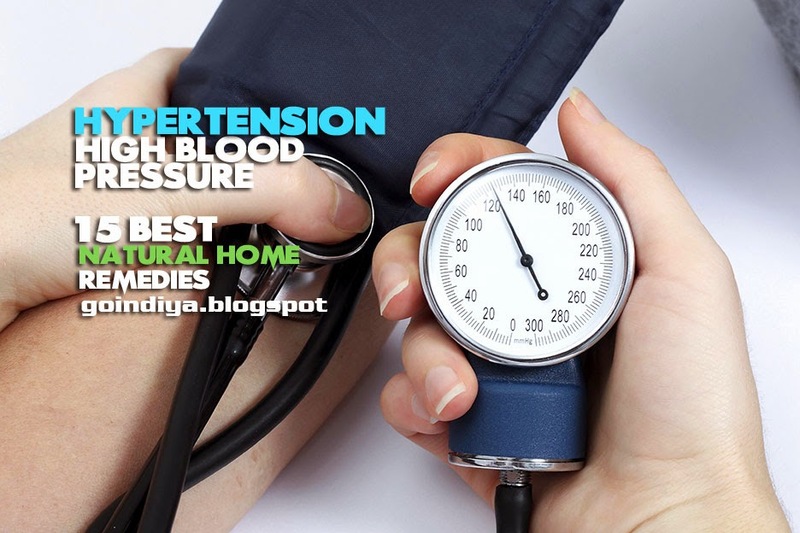 High blood pressure/Hypertension is a medical condition in which the arterial blood pressure becomes high and because of this our heart starts to perform harder than normal to circulate blood through the blood vessels in the body. The more blood our heart pumps, the narrower our arteries and the higher our blood pressure. High blood pressure is particularly risky because most of the times it has no warning signs or symptoms. It is a serious & common health problem that may cause heart attacks, strokes and in some cases kidney failure. A blood pressure level of 140/90 mmHg or higher is considered as high blood pressure. High blood pressure is become common in over age of 60-65. If person’s blood pressure level is between 120/80 mmHg and 139/89 mmHg, then he has ‘prehypertension’, it means that person do not have high blood pressure at present but possibly develop it in the future. You can take small and simple steps to prevent high blood pressure by following some home remedies and adopting healthy lifestyle. Regular consumption of garlic helps relax our blood vessels by stimulating the creations of hydrogen sulphide and nitric oxide. Garlic in any form (raw, boiled, roasted, cooked) controls high blood pressure/hypertension and also reduces cholesterol level. Garlic produces hydrogen sulfide, which promotes healthy blood circulation, removes gases and also reduces the pressure on the heart and kidney. Garlic reduces the arterial spasms and also ensures control over pulse rate and cardiac rhythm. Add garlic in your regular diet to maintain blood pressure in proper levels. You can add garlic in your food or simply chew it or consume paste of it. Consume 4-5 garlic cloves per day. If you are taking any blood thinners medicines the avoid garlic or consult your doctor first. 1. Roast 2 smashed garlic cloves in 2 tablespoon of clarified butter until garlic cloves turns to light brown. Consume these garlic with warm water twice a day. 2. Prepare 1 tablespoon of fresh garlic paste and consume it with butter milk. Do this twice a day for fast relief. 3. Mix 1 tablespoon of fresh garlic paste with 1 tablespoon of olive oil, also add 1 tablespoon of fresh lemon juice in it, mix well and consume this mixture with cup of warm water. Do this twice a day for better result. 4. Add 1 teaspoon of garlic paste to your regular or herbal tea. Consume this tea 2-3 times a day. Proper hydration is very significant for the people who are suffering from high blood pressure. Coconut is rich source of Vitamin C, potassium and magnesium, these properties reduces the systolic blood pressure/high blood pressure. Add coconut and coconut oil in your regular diet. 1. Drink 2-3 glasses of fresh coconut water every day to cure high blood pressure/hypertension. 2. Mix 1 tablespoon of pure coconut oil with 1 tablespoon of lemon juice or honey, mix well and consume this mixture with warm water. Repeat this twice a day for quick result. Lemon keeps high blood pressure/hypertension under control by strengthening the blood vessel. Lemon maintains softness and flexibility of blood vessels and by reducing stiffness of the vessels, thus it reduces high blood pressure naturally. It also reduces the risk of heart failure. 1. Mix 2 tablespoon of fresh lemon juice and 1 tablespoon of honey with glass of warm water. Drink this mixture 2-3 times a day for fast result. Add honey instead of sugar and avoid salt. 2. Add 1 tablespoon of fresh lemon juice with 1 tablespoon paste of fresh basil/tulsi leaves or mint leaves, also add 1 tablespoon of honey in it. Consume this mixture 2-3 times a day. 3. Add 1-2 tablespoon of fresh lemon juice and 1 tablespoon of fresh ginger juice or paste to regular or herbal tea and consume 2-3 times a day.